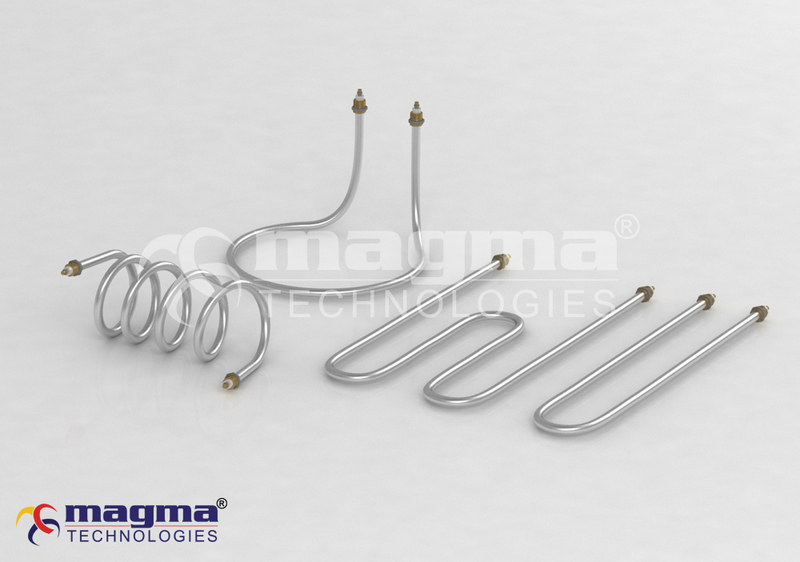 MAGMA Tubular heating elements are the most versatile and the best suited solutions to a large number of applications. Inside the metal tube, a heater coil is embedded and electrically insulated in highly compressed magnesium oxide. 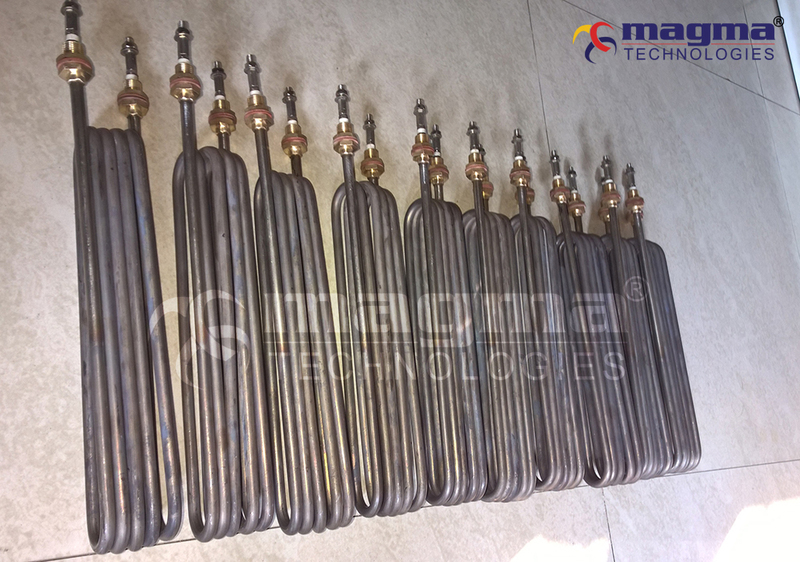 The optimized structure and very high density of the magnesium oxide form the basis for the excellent mechanical and thermal characteristics of the MAGMA Tubular Heating Elements. They can also be fitted with thermostats and temperature limiters in most applications. Tubular heating elements perform exceptional heat transfer by conduction, convection or radiation to heat liquids, air, gases and surfaces. Bends are made to customer requirements. Tubular elements from MAGMA are factory-configured to almost any shape or size. Custom bending diameters can be made upon request. Typically using steel, stainless steel, Incoloy, inconel or titanium alloys, tubular elements are often regarded as the foundation of all heating elements. 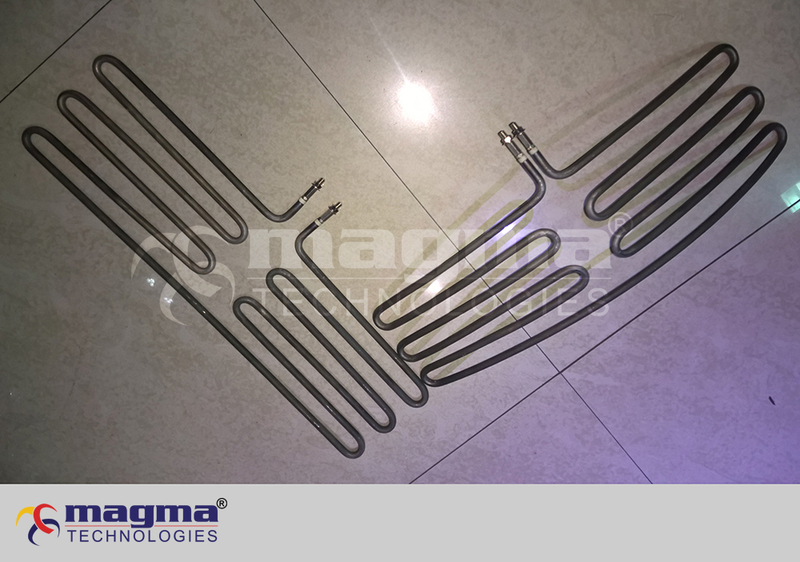 These heating elements have a strong outer sheath to help protect the heater from physical stress and uses high quality alloys to allow efficient heat transfer from resistance coil to your heating medium. 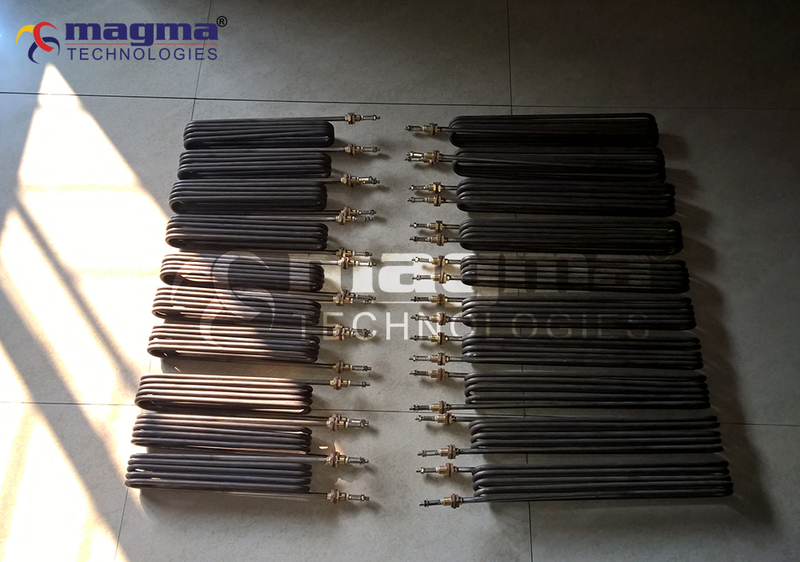 Careful selection of materials, precise manufacturing techniques as well as numerous tests and inspections ensure that our Tubular Heating Elements conform to high quality standards and offer an exceptionally long service life. Tubular heating elements may absorb moisture if they sit idle for a long period of time or get exposed to a humid environment. This might lower the dielectric characteristics of the MgO insulation and cause electrical shorting and premature failure. In order to prove the electrical integrity of a tubular heater, the insulation resistance of each circuit to ground should be checked using a 50 VDC megger. An initial reading of 50,000 ohms or more is acceptable in the field. If heaters do not pass the megohm test they should be dried out. An ideal drying procedure is oven-drying at 375F after removing the terminal hardware. An alternate procedure is to apply a lower voltage (please consult factory for instructions). The target is to attain at least 2 megohms. The sheath material type of a tubular heater depends on the operating temperature and the corrosivity of the medium within which the heater will operate. The watt density distribution on the surface of a tubular heater is critical for two reasons. First it determines the temperature that a heating element sheath will attain within the conditions that the heater is subjected to. The second reason is that every material has a specific maximum watt density that it can tolerate during its heating cycle. Table 1 below lists various sheath materials, maximum allowable temperatures and mediums within which they are recommended to operate. © 2015 MAGMA TECHNOLOGIES. ALL RIGHTS RESERVED.